This tab lists all Comodo One / Comodo Accounts Manager (CAM) accounts that you have linked to your account. Link New	- Associate another CAM or Comodo One account with this account. This lets you share licenses and funds with the other account. CAM is the management portal used by our customers and partners to track orders and purchase licenses. A CAM account is automatically created when you subscribe to Comodo One. You can log in to CAM directly at https://accounts.comodo.com/login. 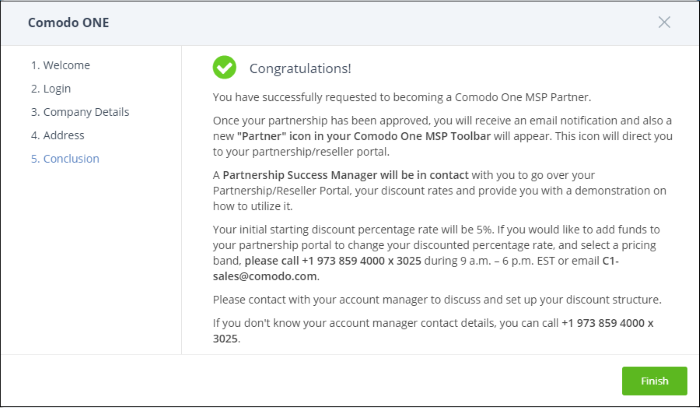 Set Partner	- MSP account holders can also become Comodo One partner to resell Comodo/ITarian products. Partners get discounted rates on all subscription-based services. These include endpoint security, web security, data backup and network monitoring and protection. The email address associated with the linked CAM/Comodo One account. The username for the CAM/Comodo One account. First name of the account holder. Last name of the account holder. Contact number provided for the account. Indicates whether the account is a Comodo partner. 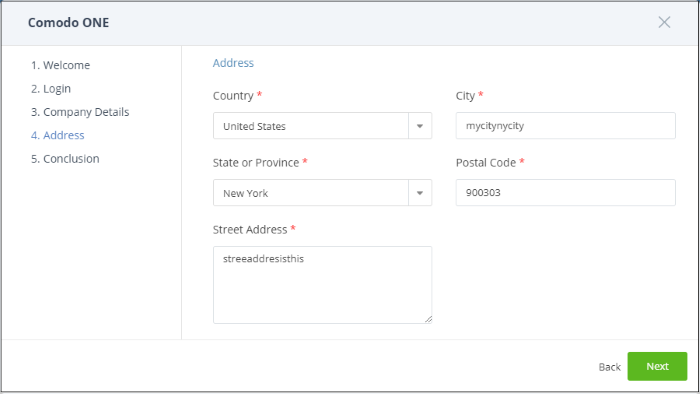 Indicates whether the account is set as default for purchasing licenses for your account. Please note you can assign only one CAM account at a time as default account. See Set a CAM/Comodo One account as default	for more details. You can navigate to different pages by clicking 'Next', 'Prev' or the page number at the bottom. A Comodo Accounts Manager (CAM) account was automatically created when you subscribed to Comodo One. This is designated as the 'default' account. You can link other accounts to the current account. 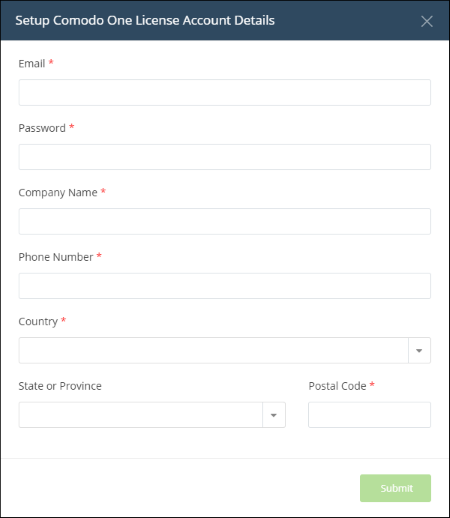 The current account can then use any product licenses held in the other account. You can also create new CAM accounts from here link them with Comodo One automatically. Enter the CAM / Comodo One account login credentials and click the 'Link This Account' button. The account will be added and listed in the table. 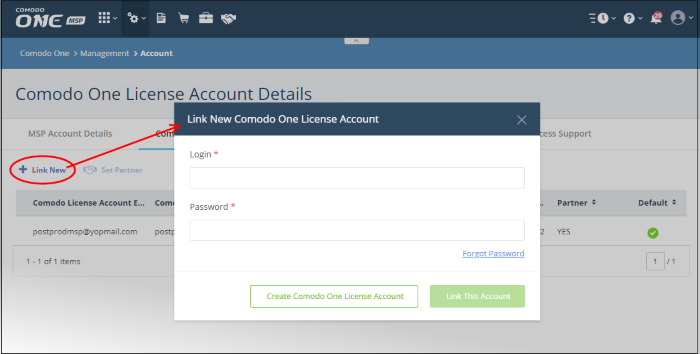 The 'Link New Comodo One License Account' dialog opens. Email - A valid email address to be associated with the new account. Password - Password for the CAM account. Company Name - The name of the company for which you want to create a new CAM account. This company name needn't necessarily correspond to a Comodo One company name. The newly created CAM account is added to the list. You can login to your CAM account at https://accounts.comodo.com/login and subscribe for Comodo / ITarian products. Make sure you set this as the default CAM account. 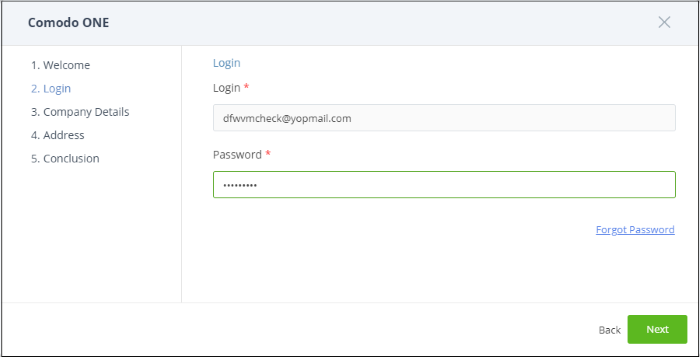 Enter the password of the current default account and click 'Set Account as Default'. The selected CAM / Comodo One account will be now set as default. See the 'App Store' section for details on how to subscribe for integrated products. 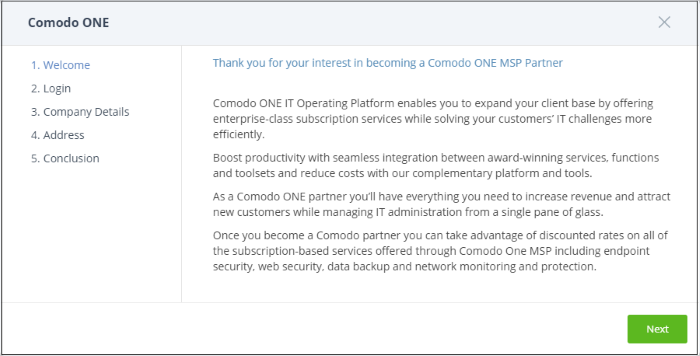 An MSP company in Comodo One can also become a Comodo partner. This brings a host of benefits, including discounted purchase prices for Comodo products and more. Purchased products can then be re-sold to your customers. Please note this feature is available to Comodo One MSP accounts only. By clicking the 'Partner' button at the top of the interface. 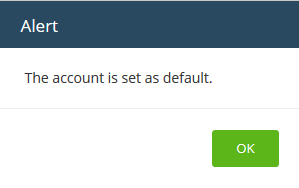 This button will be available if the default account is not already a partner. 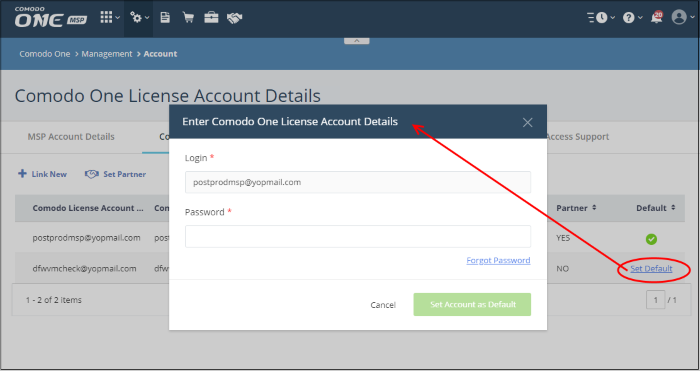 By selecting an account in 'Comodo One License Account Details' then clicking 'Set Partner' at top right. The difference is that the former method automatically selects the default account while the latter lets you choose a non-default account to be become a partner. Click 'Next' in the Welcome' dialog. The 'Login Name' is auto-populated. Enter the password and click 'Next'. 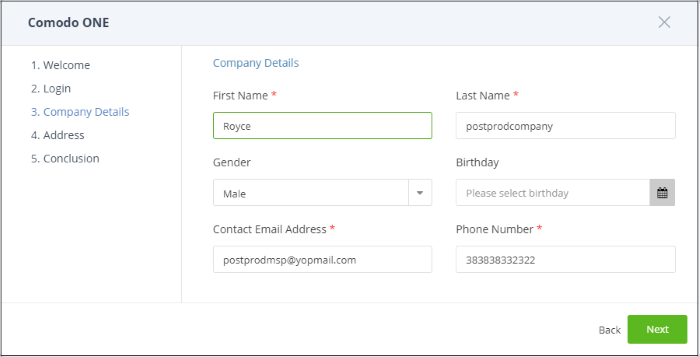 This is auto-populated with the details of the Comodo One account. 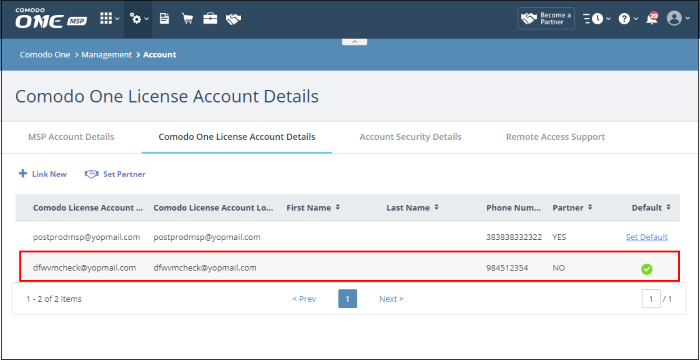 The address details of the Comodo One account will open. The conclusion step describes the benefits of Comodo One partner account. The application will be submitted to Comodo for approval. A status of 'Pending' will be shown in the 'Partner' column during this time. The status will change to 'Yes' after your account has been approved. A 'Partner' link will also appear on the file menu. The discounted prices will also be available when purchasing products via the C1 Store. See the App Store and its sub-sections for more details about subscribing for Comodo products.